The COSMO-RS technique is a novel method for predicting the thermodynamic properties of pure and mixed fluids which are important in many areas, ranging from chemical engineering to drug design. 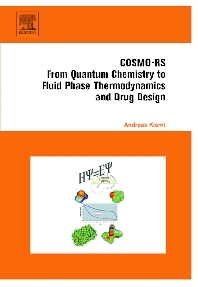 COSMO-RS, From Quantum Chemistry to Fluid Phase Thermodynamics and Drug Design is about this novel technology, which has recently proven to be the most reliable and efficient tool for the prediction of vapour-liquid equilibria. Aimed at theoretical chemists, computational chemists, physical chemists, chemical engineers, thermodynamicists as well as students,academic and industrial experts, COSMO-RS, From Quantum Chemistry to Fluid Phase Thermodynamics and Drug Design provides a novel viewpoint to anyone looking to gain more insight into the theory and potential of the unique method, COSMO-RS. 6.3 Why do some molecules like each other and others not?